12 Month Saving Calendar With What to Buy & Tips! You are here: Home / Budgeting / 12 Month Saving Calendar With What to Buy & Saving Tips! 12 Month Saving Calendar With What to Buy & Saving Tips! 12 Month Saving Calendar With What to Buy & Saving Tips! 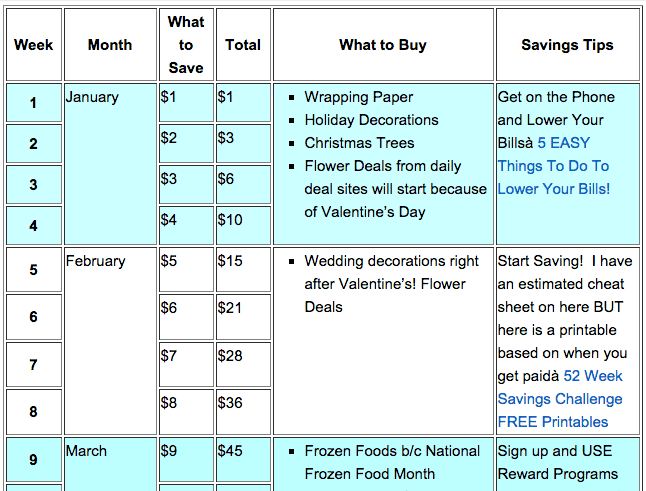 This page will tell you what to save each week, what to buy each month and TIPS to follow! I am so excited to finally finish this post for you! I am not kidding when I tell you it took me a year to finish! HERE is what your Financial goals and plan should be, I will continue to add to it as I can! For NOW be sure to PRINT this 12 Month Saving Calendar and bookmark this link! Get on the Phone and Lower Your Billsà 5 EASY Things To Do To Lower Your Bills! Sign up and USE Reward Programs and save those gift cards for you shopping needs! à Reward Programs that Earn You FREE Stuff!! Buy a summer activity pass…zoo, aquarium, pool, amusement park, etc. Plan a successful Yard Sale to earn some extra money and also do a little Spring Cleaning! à Garage Sale Tips: Plan a Successful Yard Sale With These Ideas! More flower deals (save them for birthday’s, etc. If you haven’t signed up for tons of Birthday FREEBIES do it now so when your Birthday comes around you get some great coupons. How Your Smart Phone Can Save You Money! Avoid These Classic Money Mistakes! Create a Monthly Meal Plan. Many readers enjoy using e-meals! Get 50 Meal Plans and Grocery Lists!